Two members of a robbery gang terrorising residents of Satellite Town, in Amuwo Odofin Local Government Area of Lagos State, yesterday, disclosed that the gun they used for operations had no bullet in it. The suspects, Nwulu and Danjuma, told Vanguard when they were paraded before newsmen, by the Lagos State Commissioner of Police, Imohimi Edgal, at the State Command, Ikeja, that they used the locally-made pistol to scare their victims. The Police boss, Edgal, told reporters during the parade that the Command, on receiving intelligence report on activities of the gang, which specialised in phone snatching, deployed operatives at the Satellite Division, led by the Divisional Police Officer, Audu Ibrahim. He said the operatives made a breakthrough when it received a report that that the bandits had successfully robbed a resident of his laptop at gunpoint. 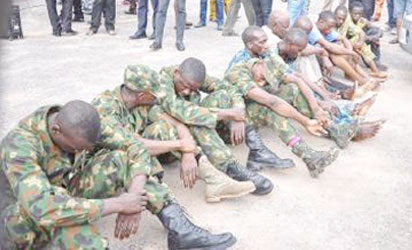 Edgal further disclosed that men of the Federal Anti-Robbery Squad, at the Lagos State Police Command, Ikeja, also busted fraud syndicate and apprehended three members of a fraud syndicate which specialised in defrauding unsuspecting members of the public, using charms and a fake shrine. Vanguard gathered that suspects, Ojo, Ifedayo and Olaleye, were rounded up in a house at Marwa area of Lekki, Lagos, where assorted charms and a shrine was discovered. 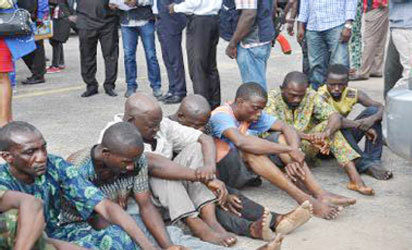 He said the suspects had relocated to Lagos recently from Aramako in Ekiti West Local Government Area of Ekiti State to canvas and lure victims into performing fake money rituals. It was learned that the operatives got wind of their plans, trailed and apprehended the suspects, while their charms were recovered.